On the road between downtown Cairo and the famous pyramids of Giza, the Hotel Europa Cairo is 26 km from Cairo International Airport. Whether you come for shopping, sightseeing, or entertainment, the area surrounding the hotel offers it all. Situated close to the Giza, Europa Hotel Cairo is just a kilometre from the railway station and 10 minutes drive from the pyramids and sphinx. 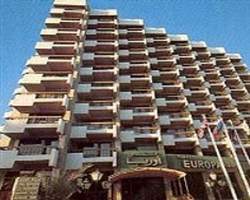 The Hotel Europa Cairo offers 250 rooms and suites with a balcony, air-conditioning, telephone, TV with video channels and a minibar.The hotel offers comfortable guestrooms that are pleasantly decorated and facilitated with a host of modern amenities. Attentive room service is also provided for your convenience. Dine on dishes from the east and the west in the hotel restaurant, sip some java in the Coffee Shop, or dance and drink the night away in the Bar and Night Club. The Hotel Europa Cairo offers banking services, a swimming pool on the roof with a view of the pyramids in the horizon, sauna and fitness centre, bazaar, boutique and jewellery shop.